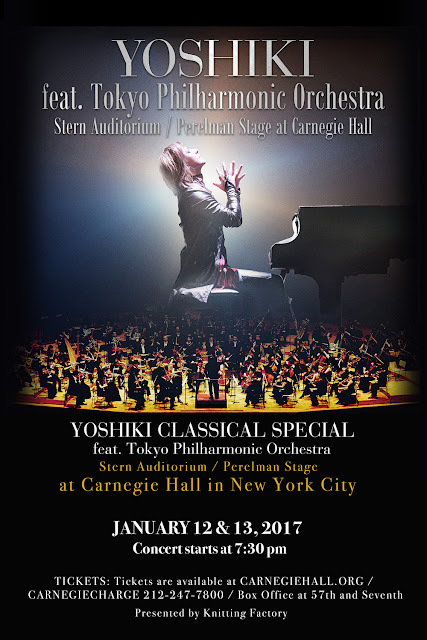 Tokyo Rebel: Yoshiki Classical Concert at Carnegie Hall! Yoshiki Classical Concert at Carnegie Hall! In addition to being the founder of Japan’s biggest rock and visual kei band X Japan, Yoshiki is also a classically trained composer, and musician. On January 12 and 13, 2017, he'll lead the Tokyo Philharmonic Orchestra on the piano for a special classical concert at Carnegie Hall! Whether you are a fan of X Japan, J-rock, or just classical music, this is a must-see concert! Get tickets and VIP Meet & Greets now! New Year Party Event Report! Tokyo Rebel New Year Tea Party!